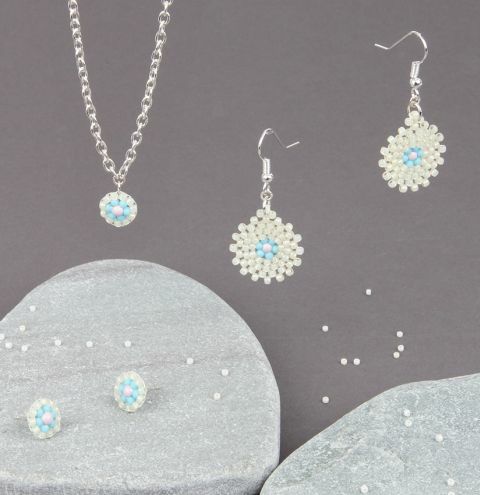 Make a delicate floral jewellery set using tiny seed beads and Swarovski pastel pearls. Step 1. Thread a needle with 12 inches of Fire line thread. Take your thread around the pearl twice, this creates 2 “thread bridges “which provides a base for us to bead on. Leave a tail of 3 inches. Your thread should be fairly flush to the surface of the pearl bead. Step 2. Thread 2 seed beads on to your needle and pass the needle under one of the thread bridges. The beads should stay on the other side of the thread bridge. Pull until nice and fairly tight. Then pass the needle up through the outer bead from the bottom. bridge and then pushing the needle up through the bottom of the outer seed bead. Keep an eye on the placement and tension of the bead, aiming for even placement and flush to the base. Repeat until you have 6 seed beads, you will have covered both of the thread bridges. Step 4. To finish the first round your needle will exit the 6th bead from the top and enter the first bead from the top too. Pull tightly and manipulate the placement of the beads to be as evenly spaced as can be. Pass your needle through the 2nd bead in the row, from the bottom to exit the top of the bead. pendant we need to apply a link which we have cut off from some soldered chain length to the beading. A cut off chain link is ideal due to its unobtrusive size and it has no gap either (a gap like the one a jump ring has could cause it to fall away from the thread), to that end make sure you use soldered chain. Always apply the link in the middle rather than at the end of the row to provide a stronger finish. To apply; thread on the cut off link FIRST and a seed bead and continue as before. back weave this too and cut off any excess. and glue the discs to the flat ear stud findings. shapes as you learn more, it really is a very versatile technique.